Do you need garage clearance in Walthamstow E17? We have the perfect solution! We’ve been supplying garage clearance Walthamstow home owners consistently rate highly and are happy to refer for more than a decade. They appreciate us for our prompt, flexible services and reasonable rates. We think you are going to as well! Is your garage packed with superfluous clutter? Are you tired of leaving your vehicle out in all weather conditions because there’s no space for it in the garage? It could be that you have made up your mind to transform your garage into a workshop or home gym? Or maybe you’re moving home and need to get rid of all that junk fast? 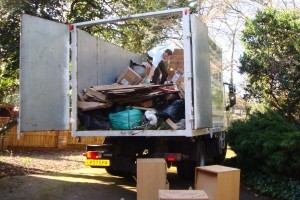 These are but a small number of the reasons that customers in the E17 area decide to use our garage clearance service. No matter what your reasons are, we can guarantee you efficient and flexible service at an inexpensive price. We are licensed waste carriers. You can rely on us to perform a completely professional job and dispose of all your waste responsibly and legally. We are a local firm and we operate seven days a week from 7 in the morning until 11.30 at night. Evening and weekend bookings are always readily available. We supply a prompt, same day collection services. When you need us we are only a telephone call away. Scheduling is in two hour slots and we’ll always call ahead of time to update you on our estimated time of arrival. Our clear-cut pricing means there won’t be any nasty surprises when the job is completed and we present the bill. The price we quote is what you will pay with no hidden add-ons. We recycle 80 per cent of the junk that we remove. To speak with a member of our trained team about your requirements for garage clearance Walthamstow just phone us on 0208 504 7390 or 07957 123019. We’re right here 7 days a week to take your call and will gladly answer any concerns. Plus we’ll supply a very competitive estimate that’s inclusive of all labour, carrier and disposal fees. Or, submit your details using our online request a quote form and we’ll respond you quickly.